The congregation of Christ here in Buffalo has a membership of about 33 members. Our members range in age from 14 yrs to 85 yrs. We hold our worship services at 11 am Sunday morning, and at 6 pm Sunday evening. Bible studies are held at 10 am Sunday mornings, with an adult class, a teen class, and a pre-teen class. There is also a Wednesday evening adult bible study at 7 pm. 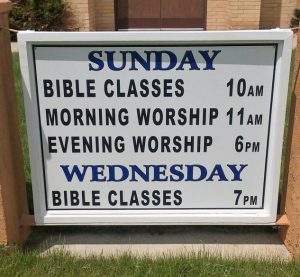 All worship assemblies and bible studies are held at our building located at 1100 Fort St. Buffalo, Wy. Fort St is the same as highway 16 west, that goes over the Bighorn Mountains and heads toward Yellowstone Park. If you are ever in the neighborhood, we invite you to stop by and worship with us, or take part in one of the bible studies. Visitors are always welcome and we promise that we will do our very best to make sure that you are made to feel right at home during your visit here. Personal bible studies are always available by contacting us through one of our contact phone numbers or by email. You can also leave a comment here on the website, and we promise to get back to you as soon as possible, usually the same day. Please leave a message if no one answers, and we will get back to you as soon as possible. The church first gathered for worship here in Buffalo in 1956, when a total of eighteen people met in the home of Mrs. Stella Reynolds. That same year five gospel preachers from around Wyoming met here in Buffalo to conduct a gospel meeting. The church began meeting with regularity in 1957, but then some people fell away, and others moved away, and the congregation disbanded for at least a few months, in 1957. Then in January 1958, a new effort was made by members of the congregation to assemble together when Elmer and Vashti Huff began holding bible study and worship service in their home in Buffalo. When they first began meeting together, there were six adults and one child who assembled for worship. We have collected and saved much detailed information about the church’s struggles during these early years, but from that point on, in 1958, the church of Christ has never ceased to assemble for worship in Buffalo, Wyoming. The church in those days came together in private homes and in rented buildings and borrowed buildings, whatever was available. But thanks to the efforts of one brother J.T. Bristow, funds were raised to build a much needed building in which to meet in. The construction commenced on Tuesday, June 6, 1961, and the building was completed, and an “Open House” was held on Aug. 27, 1961. There were over a hundred people present for the open house, with 74 who attended an afternoon singing, and 59 who came back for evening worship. In 1958 the church began it’s efforts to restore itself with six adult members. By 1963, there were 29 members. The membership fluctuated for several years, but in 1973, the congregation found itself with only one man, 5 women, and three children remaining. Despite the struggles, that small group managed to maintain itself and to assemble for worship every first day of the week. In the mid 70’s growth came, and their perseverance was rewarded, as the Lord added to their numbers. Today the church still meets in that same building located at 1100 Fort St. Our membership at the time of this writing is 33. We’ve had many people come and go over the years. Many have just moved on to various areas of the country, and others have moved on from this life. But we thank God for the faith and hard work that many individuals have put forth over the years to keep the congregation alive and strong, in Buffalo, Wy. We do want to invite everyone to come and worship with us if you are ever in our part of the country. In the meantime, we urge you to continue to visit our website, and to leave your comments here, and to ask us any questions you may have concerning the body of Christ, or this particular congregation, or any spiritual topic at all. We love to talk about Jesus and those He died for, and we love to teach His word. May God bless you all, according to His will. Yours truly, in love; the body of believers in Christ, in Buffalo, Wyo. we have you in our hearts , because, you are working as Philadelphia church Of Christ in Revelation,Chapter 3:7-13. We love you all. God bless you all,amen. Churches of Christ in India Salute you. Hi Adam. my good friend and brother. Thank you for your kind words and for your prayers. We in turn pray always for you and your family there in India. And we pray too for the work that you do there. your brother in Christ, Jim. that the young ruler’s heart was covetous. Consider how rich Abraham was. Abraham and his nephew Lot, had so many herds, that they had to split up, because the land could not hold them all! Gen 13:6 Yet God continued to bless Abraham in all that he did. It’s no different today. It’s no sin in having possessions, if we use them to the glory of God. It’s when covetousness grips our heart that the sins comes in. Remember, it is not money that is the root of all evil, but rather “the love of money”, 1 Tim 6:10. Please tell us how you feel about this. But I hope you will also remember, that we do need scripture to back up all of our convictions. God bless you Cleveland, Jim. Why does this man feel like it is a sin for the church to have a building to worship in? I don’t understand that. Hi, thanks for your question. I think the basis for this belief comes from a verse of scripture in Mathew 19:16-26. A rich young man asked Jesus what he must do to inherit eternal life. Jesus told him to keep the commandments of God. And the young man told Jesus that he HAD kept them from his youth. Then Jesus told him to go and sell what he had, give it to the poor, and come and follow Me. And so people jump to the conclusion that Jesus was teaching that we are not supposed to own anything. But what Jesus was teaching is that covetousness will keep one out of heaven. Jesus could read the heart of the young man, and this man was covetous. He had “many possessions” the scripture says. And because he had many possessions, he went away sad. And so Jesus said, “It is hard for a rich man to enter the kingdom of heaven. You see, when we have many possessions, we want to keep them! Not sell them and trust in Jesus. It’s not sinful to have possessions. It’s only sinful to TRUST in them. MONEY is not the root of all evil, but the LOVE of money is! 1 Tim 6:10. Thanks for visiting and for your question. I hope this helps you understand.